CÀ MAU – The chairman of the Cà Mau Province People’s Committee, Nguyễn Tiến Hải, has instructed competent agencies to diligently carry out the task of preventing forest fires in the 2018-19 dry season. 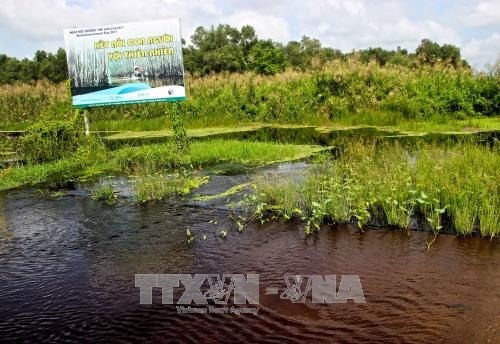 The Department of Agriculture and Rural Development, the U Minh Hạ National Park, the U Minh Hạ Forestry One Member Limited Company, and the people’s committees of U Minh and Trần Văn Thời districts are responsible for implementing the task, he said. They have to carefully protect more than 8,500ha of cajeput trees in the park, he said. It is located in U Minh and Trần Văn Thời districts. The southernmost province, which has the largest area of submerged forests in the country, has more than 43,500ha of cajeput besides forests on Hòn Khoai, Hòn Chuối and Hòn Đá Bạc islands, which face a high risk of fires in the dry season lasting between November and May. The agencies have also been ordered to work with the media to disseminate forest protection regulations to the public and raise awareness of preventing forest fires. Forest management units and companies will go over their plans for fighting fires in the dry season and have human resources and facilities in place for the task. They have been instructed to carefully keep an eye out for people starting fires in forests and nearby areas. In the 2017-18 dry season there was one fire that damaged around 3,500sq.m of forests. Since there were measures for preventing forest fires in place, it was extinguished immediately before causing too much damage, according to the Forest Protection Sub-department. Cà Mau has 95,400ha of forests, which cover about 25 per cent of its land mass, according to its Department of Agriculture and Rural Development. Of the figure, 53,000ha are grown to harvest timber, 18,000ha are special-use forests and 23,000ha are protective forests. Some 21,600ha have been handed over to 5,000 households to protect and exploit its resources.